On an average day, Hawaii’s 1.4 million residents host 220,000 visitors and up to 35,000 people fly in and out of its airports. In 2017 more than 9.1 million tourists are projected to visit Hawaiʻi, the highest total ever. By 2020 this number is expected to rise to just over 9.5 million. The president and CEO of the Hawaiʻi Tourism Authority, George Sziget, supports this growth, while acknowledging that it needs to be thoughtfully considered. In an interview with ‘Hawaiʻi News Now’ Mr. Sziget said, "We are committed to maintaining this positive momentum in 2017, while also assessing as to how HTA can collaborate with industry partners and community advocates to ensure that promoting tourism is balanced with the perpetuation of Hawaiian culture and protection of Hawaii's natural resources." How can nanotourism take root in a system designed to accommodate mass tourism? 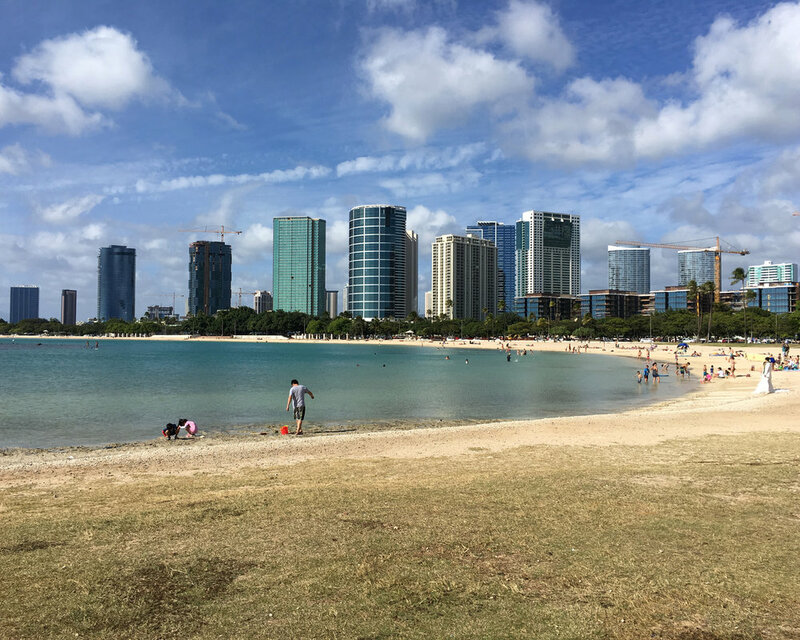 This course will focus on Kakaʻako, a 600-acre waterfront district in downtown Honolulu. Kakaʻako originated as coastal swamplands, where native Hawaiians fished, produced salt, launched their canoes and practiced religious rituals. A large portion of current day Kakaʻako sits on reclaimed land built upon coral reef. Rapid urbanization in the early 1900’s saw downtown Honolulu stretch east into Kakaʻako. It transitioned into a residential area inhabited by tenements and immigrants camps, that were themselves eventually displaced by small industrial businesses and warehouses. How can nanotourism create social awareness about the local indigenous history and culture? For the past three decades, developers and state officials have been repositioning Kakaʻako as a mixed-use, walkable, urban village that is planned to be the densest neighborhood in the Hawaiian archipelago, housing over 30,000 residents. Today, Kakaʻako is home to one of Hawaiʻi’s most vibrant arts scenes, hosting the annual ‘POW! WOW!’ arts festival. Local and international artists create urban scale art pieces on the faces of the warehouses that line the streets of this emerging neighborhood. Microbreweries and farm-to-table restaurants are springing up alongside new residential highrises and the remaining warehouses. 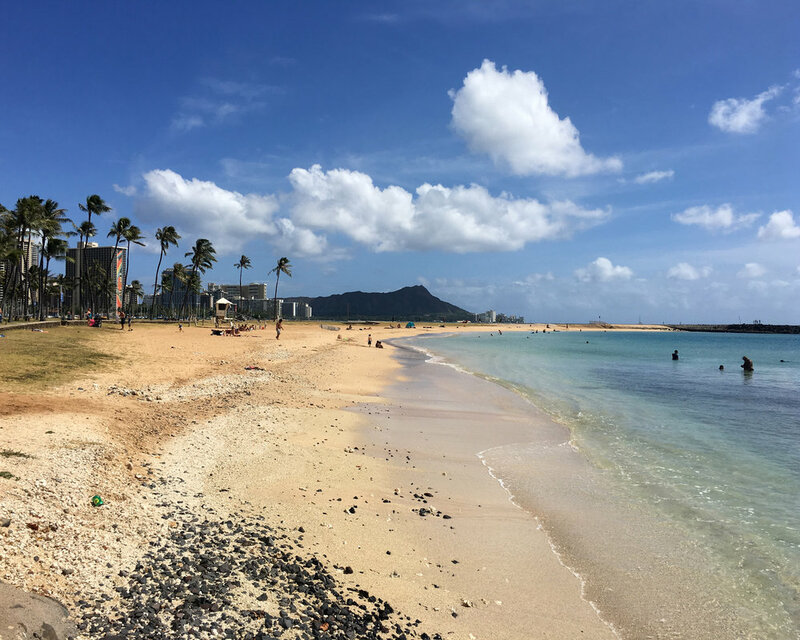 What role can nanotourism play in Kakaʻako’s rapid transformation? nanotourism is a creative critique to the current environmentally and economically unsuitable effects of mainstream tourism by proposing locally-specific alternatives through bottom-up processes. The programme focuses on the development of design strategies which rely on local material and social resources to create hyper site-specific projects in 1:1 scale. Karla Sierralta (b. 1976) graduated at the Universidad del Zulia School of Architecture in Venezuela and at the University of Illinois at Chicago ( M. Arch, Fulbright Scholar). In 2007 she co-founded the design strategy and architectural practice Strawn + Sierralta. She has taught architecture studios since 2006 and is currently an Adjunct Assistant Professor at the School of Architecture at the University of Hawaiʻi at Mānoa. Brian Strawn (b. 1974) graduated at the University of Illinois at Chicago (M. Arch) and Illinois Institute of Technology’s Institute of Design (Master of Design). In 2007 he co-founded the design strategy and architectural practice Strawn + Sierralta. He also leads research and strategy projects at the University of Hawaiʻi Community Design Center. Jakob Travnik (b. 1991) graduated in architecture from University of Applied Arts Vienna, Institute of Architecture (Mag. Arch. with distinction). Active as consultant and designer at Atelier LUMA, Arles, France. Currently teaching and working on his PhD on the topic of nanotourism at TU Vienna. of 88 Block Walks, an ongoing series of walking tours in Kaka’ako. Working at the intersection of geography, art and activism, Adele promotes awareness of socio-spatial inequality and advocates for community agency through personal narratives, mapping, and interaction with urban environments. The first Curator of Arts of Hawai‘i at the Honolulu Museum of Art. Her diverse background in the arts allows her to oversee a collection that crosses museum departments. Healoha frames critical conversations about the impact of traditional and modern Hawaiian arts on both local and global cultural landscapes. Independent Hawaiian Cultural Specialist and Junior-Architectural Preservationist. A Hawaiian Lifestyles teacher at Kamehameha Schools-Kapālama but trained as an architect, Ikaika has become a rare gem in Native Hawaiian education and in the architectural profession. Artist, illustrator, and curator. Jasper is the creator and lead director of POW! WOW! HAWAI‘I, which is a non-profit organization of contemporary artists committed to community enrichment through the creation of art outreach programs, educational programs and engaging the community in the creation and appreciation of art. He is the co-founder of the thriving art gallery Above Second in Hong Kong as well as co-founder of the community art center Lana Lane Studios, a progressive 2D/3D creative workspace and center for teaching and learning in Honolulu. His latest venture Big Bad Wolf is an apparel store creating street culture inspired kids wear with an arts focus. Creative Director of Sig Zane Designs and SZKaiao comes from an generational Hula family and practice that grounds and informs his day to day career as a designer. Zane, who studied graphic design at the Fashion Institute of Design and Merchandising in Los Angeles, was a member of PBN’s Forty Under 40 class of 2015. He’s worked with his father, company founder Sig Zane for the past 16 years, on everything from the company’s signature aloha shirts to their new Oahu location, Sig On Smith. Kuhao has worked with his father and Hilo design team SZKaiao, to expand their unique design aesthetic to now include airplane liveries, hotel interiors and surfboards. Educated as an architect, Mimica was a lecturer at the Faculty of Architecture at the University of Zagreb and a postgraduate researcher at the Delft University of Technology. He was previously the Director of Studies of the Berlage Institute. Currently Professor at Illinois Institute of Technnology (IIT), College of Architecture. Professor Emeritus of Environmental Design and Geography at the University of California at Davis. He is the author of The Tourist: A New Theory of he Leisure Class and a number of other studies of contemporary culture and hyper-modernization. His current research is on tourism and the unfinished project of democracy.